The Jack Russell Terrier Club of America (JRTCA) was founded in 1976. Thirty years later, thousands of members are united in admiration of and dedication to the protection of the Jack Russell Terrier. Although Trump's bloodlines have not survived, the ideal of the hardy, old-fashioned, willing-to-work terrier that she embodied lives on in the JRT. t > What Is the Jack Russell Terrier Club of America? The JRTCA is the largest breed club in the world dedicated to the Jack Russell Terrier. It is opposed to kennel club recognition of the breed and has a breed standard and a unique registry that allows registration only of adult dogs who are reviewed by a veterinarian for soundness and are found to be free of detectable defects. The JRTCA sanctions judges for the canine sports it supports, including conformation, go-to-ground, racing, and field work. The JRTCA is also an educational organization dedicated to the motto "Preserve, Protect, and Work." It has an associated Research Foundation (www.jrt-research.com) that encourages, promotes, and supports research on genetic defects found in Jack Russells. It also supports Russell Rescue Inc. (www .russellrescue.com), a group that places abandoned, good-natured, healthy Jack Russells in permanent homes. 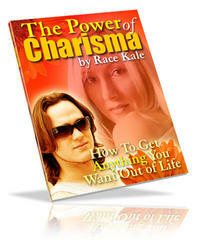 broke away from the JRTCA, with the intention of seeking recognition for the breed from the American Kennel Club. 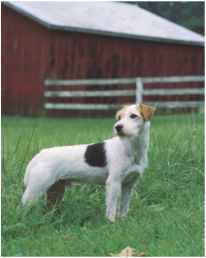 The Jack Russell Terrier was recognized by the United Kennel Club in 1991 and by the American Kennel Club in 1997—two moves that were opposed by the JRTCA. Why do most of the Jack Russell Terrier clubs and the Jack Russell Terrier United World Federation oppose recognition by any all-breed kennel club? 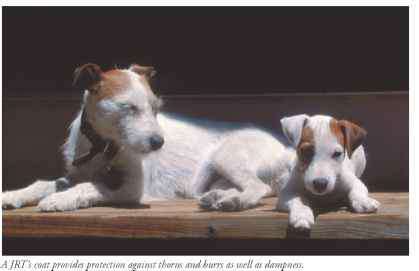 Why does the Jack Russell need "protection"? Showing dogs in highly competitive conformation contests has resulted in physical and mental changes to nearly every breed in history. While this kind of competition may be fine for other breeds, it is not suitable for the Jack Russell because beauty alone has nothing to do with the dog's ability to perform the task she was bred to do.